New recruit from Essex, Hello to all. Hi, just joined, still searching site, I'm not an overly experienced skirmisher, been on a few "modern" ones, .....not overly impressed by the attitude of some members, after all it's a game. Got a fair amount of Airsoft weapons mostly WW2 era, want to use them in context. I do all my own repairs and servicing, I've also got loads of "bits of uniform" hanging around, but no complete one. Re: New recruit from Essex, Hello to all. Have a look around the forum ask questions there is not anything that someone doesn`t know due to the knowledge base on here. Kit wise go `Generic` soldier. basic impression. Get swankey camo stuff or airborne stuff later it will serve you best in the long run. As above ,choose a side ,get a basic infantry kit and get to a game . don't wait till your kit is stitch perfect or complete ,if you look at the game threads there's always a kit loan section for what you don't have ,loaned on a you bend it you mend it basis . Buy the best kit you can when you can, based on advice from the forum ,there is a lot of kit of poor quality or just made wrong so always ask before you buy ,if you arrive with a pair of boots and a pair of trousers of good quality and borrow everything else its better than getting a full set of nearly right or poor quality stuff that you have to spend again later to replace ,or spending Â£1000 on your first game and hateing it never to play again. Do you go to any open days at Skirmish Airsoft Billericay? There's a few of us now who go wearing our ww2 kit. We could all have a meet and show the modern lot how it's done. Thanks guys, good advice from dadio, I'll have to dig out uniform stuff, it's probably shrunk, can be me putting weight on! 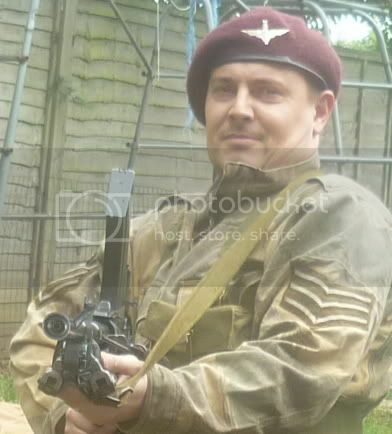 I do like using my Ppsh 41 so might go Russion unless it's allowed to be captured by a German! I'm not too far from Billericay, so if you want to let me know what's happening I'll tag along, Granger, but I'm no spring chicken! Probably older than most guys on this forum. Various games have different kit requirements ,some entry level games only require you to scrim up an M4 to disguise it ,other games may require a rifle only or anything in between ,its not uncommon for any period weapon to be acceptable ,of course the ideal is to have the correct weapon but not everyone is that wealthy ,weapons are often loaned out for a game on a you bend it you mend it basis if you want to attend a game and don't have an acceptable weapon. Let me know next time you go to billericay and I will come through the tunnel to join you all... Bored being the only ww2 at apocalypse! Hello and welcome to the forum! Ask away with any questions no matter how straight forward they are; keep your kit generic and try and get to a game when you can...the rest will come from there! paule wrote: Let me know next time you go to billericay and I will come through the tunnel to join you all... Bored being the only ww2 at apocalypse! Next time we go I'll post and open invitation on the forum so we can all have a meet up. Sounds good to me, I'm up for that.